Which pool deck material works best for your outdoor living space? A pool is and always has been a symbol of luxury and a testament to the beauty of modern design. 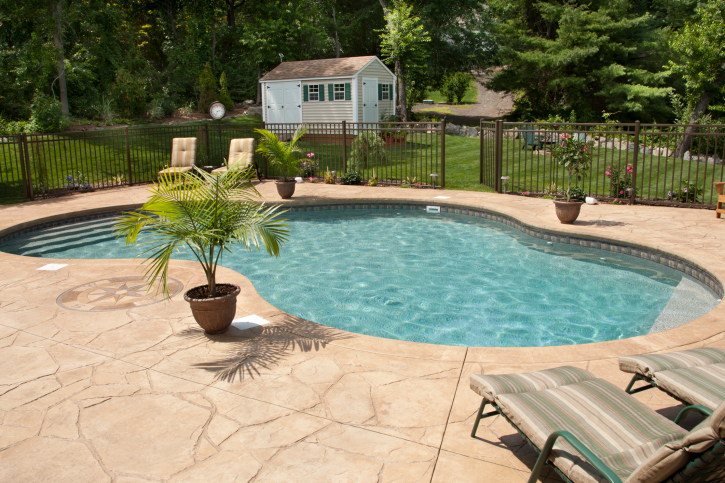 However, an old concrete pool deck can detract from your outdoor paradise’s aesthetic value. Today we’re going to be talking about some beautiful modern alternatives to concrete so that you can open your pool with a flourish next summer. Let’s take a look. Modern pavers provide convenience and beauty. Pavers are how you can upgrade your pool to encompass the beauty of modernity and cost effectiveness. Now, pavers come in many shapes, styles, and colors so it is important that you choose the right ones for your home. Take inspiration from the architectural details of your outdoor space and try to select pavers that compliment them. You should always make sure that your design choices are working together to create a cohesive look. Flagstone provides a fresh look. If you’re looking for a earthier pool deck, then the warmth of flagstone will fit in nicely. This is a flat paving stone that will resist both moisture and heat quite well. Not only that, but flagstone will also provide a non-slip surface for you to walk on so that you don’t have to worry about falling in. Travertine brings luxury and beauty to your pool deck. For a light, hardworking surface, travertine might be exactly what you are looking for. This material is exceptionally porous which means that it has a knack for absorbing water and keeping itself cool on hot summer days. Travertine is also good for those cold Maryland winters due to its ability to handle the freeze/thaw cycle. As for its color and finish, there are quite a few styles to choose from to help fit your yard’s aesthetic. This entry was posted on Friday, November 4th, 2016 at 4:59 pm. Both comments and pings are currently closed.